Charles Kent Wilson (born January 29, 1953), also known as Uncle Charlie, is an American musician, singer, songwriter, producer and the former lead vocalist of The Gap Band. As a solo artist he has been nominated for thirteen Grammy awards and ten NAACP Image Awards (including two wins), received a 2009 Soul Train Icon Award, and was a recipient of a BMI Icon Award in 2005. In 2009, he was named Billboard magazine's No. 1 Adult R&B Artist, and his song "There Goes My Baby" was named the No. 1 Urban Adult Song for 2009 in Billboard Magazine. On June 30, 2013, BET honored Wilson with a Lifetime Achievement Award that was presented to him by Justin Timberlake. The BET tribute performances included renditions of Wilson's songs performed by India Arie ("There Goes My Baby"), Jamie Foxx ("Yearning for Your Love"), and Stevie Wonder ("Burn Rubber") but it was not until Wilson himself took to the stage at the request of Timberlake to perform his Grammy-nominated song "You Are" and then transition into a medley of hit songs performing alongside Timberlake and surprise guests Snoop Dogg and Pharrell Williams that Wilson stole the show during the youth-oriented program. The Charlie Wilson tribute helped BET achieve the highest ratings in years for the program and also earned the network the #1 primetime spot in the 18–49 demographic topping all its broadcast and cable competition for the night in both demographics and total viewers. Later that year, Wilson was featured on the single "Bound 2" by Kanye West, however his vocals were uncredited. Wilson is the national spokesman of the Prostate Cancer Foundation where there is a Creativity Award in his name which donates hundreds of thousands of dollars a year to researchers across the country for the development of creative science that conforms to PCF funding principles but is short-term and designed to allow development of otherwise unfunded ideas. In 1995, Wilson married Mahin Tat. They met in that same year, when she was his social worker during his time in a drug rehabilitation program. Since 1995, Wilson has been clean from his cocaine and alcohol addictions that led him into becoming homeless and to begin sleeping on the streets of Hollywood Boulevard from 1993 to 1995. In 2008, he was diagnosed with prostate cancer and treated successfully with implants. He has since worked with the Prostate Cancer Foundation, encouraging black men to be tested for the disease. He has also spread awareness by providing vocals for Lupe Fiasco's single, titled "Mission", which focuses on cancer survivors. Wilson has been nominated for thirteen Grammy Awards. 2018 Grammy Nomination – Best Traditional R&B Performance for "Made For Love"
1983 Grammy Nomination – Best R&B Instrumental Performance for "Where Are We Going"
2018 NAACP Image Award Nomination - Outstanding Duo, Group, or Collaboration for "I'm Blessed"
Charlie Wilson's vocal style and performance continue to influence some of today’s most popular artists, including Snoop Dogg, R. Kelly, Justin Timberlake, Aaron Hall, Bruno Mars and Kanye West. 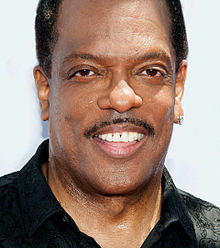 ^ The Wikipedia Files with Charlie Wilson (Gap Band, not late congressman). Archived June 18, 2010, at the Wayback Machine Wikipedia Files. 6 April 2010.